Barracuda 545 is a great boat for all day boating with your family and friends. 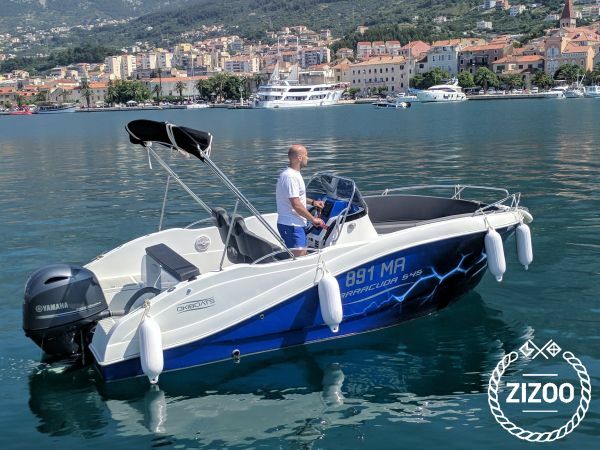 It is distinguished by the sporty design and the high boat sides will provide you the needed confidence while driving with your children. It can easily take 7 people. It has enough space for sunbathing in a front and sitting in the back. For navigation you can use GPS and also you have a deck shower. It is powered with outboard engine Yamaha 115 thanks to which you will reach favorite destination in a short time. We are located in Makarska, and from there you can visit islands Hvar and Brač. Just find a hidden bay and enjoy the crystal Adriatic with an amazing view.